The Faculty of Aerospace Engineering enjoys a long and varied tradition of collaboration with the aerospace sector, both in teaching and research. The world is changing rapidly, making its relationships with the business community more important than ever before. The faculty is also becoming increasingly pro-active in exploring new forms of collaboration. The faculty's Business Portal is a ‘landing page’ offering a clear overview of all the ways businesses can contact the faculty and opportunities for collaboration. This will further increase both the visibility and the accessibility of the faculty to the outside world, with the aim of: “Connecting Business to Science and Education”. There are many ways in which research can be carried out by or with our researchers. Aerospace engineers from TU Delft are potential employees with knowledge of aerospace engineering. 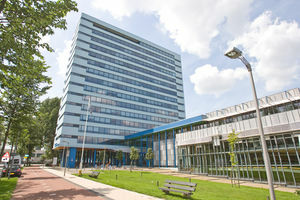 The faculty has a complete range of high-tech facilities at the disposal of students, researchers and partners. Our mission is to guarantee a sustainable future through a firm foothold in the world by establishing and maintaining a good relationship with our alumni. We want to use our knowledge to make a contribution to sustainable, innovative solutions to societal challenges.